The Amsterdam based artist couple Erwin Driessens (1963 Wessem) and Maria Verstappen (1964 Someren) have worked together since 1990. 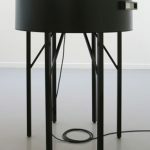 After their study at the Maastricht Academy of Fine Arts and the Rijksakademie Amsterdam, they jointly developed a multifaceted oeuvre of software, machines and objects. They attempt an art in which spontaneous phenomena are created systematically. Art that is not entirely determined by the subjective choices of a human being, but instead is generated by autonomously operating processes. In addition to working with natural generative processes, the couple develops computer programs for artificial growth and evolution. An important source of inspiration at this are the self-organising processes in our natural surroundings: the complex dynamics of all kinds of physical processes and the genetic-evolutionary system of organic life that continuously creates new and original forms. Driessens & Verstappen participated in numerous exhibitions in the Netherlands and abroad, a.o. Stedelijk Museum Amsterdam, Centraal Museum Utrecht, Centre Pompidou Paris, LABoral Gijón, IVAM Institute Valencia, Museum Kröller-Müller Otterlo, Les Abattoirs Toulouse, Eyebeam New York. The couple gives lectures and presentations at universities, art academies, festivals and conferences, a.o. Siggraph Los Angeles, Sonic Acts Amsterdam, Second Iteration Melbourne, Atonal Berlin. In 1999 and 2001 their Tickle robot projects have been awarded first prize at VIDA, an international competition for Art & Artificial Life. In 2013 they received the Witteveen+Bos Art+Technology Award for their entire oeuvre. The artists are represented by DAM gallery in Berlin.